The Assessment Report identified the areas where drinking water sources in the Cataraqui Source Protection Area are vulnerable to contamination and overuse (including sensitive groundwater areas, wellhead protection areas, and intake protection zones), and prioritized drinking water issues and threats within those vulnerable areas. The report pulled together the findings of over 15 technical studies about local sources of drinking water and the risks that affect them, all of which are appended to the Assessment Report. The Assessment Report was finalized in June, 2011, and was approved by the Ontario Ministry of the Environment and Climate Change in October, 2011. It was used to support the development of the Cataraqui Source Protection Plan. 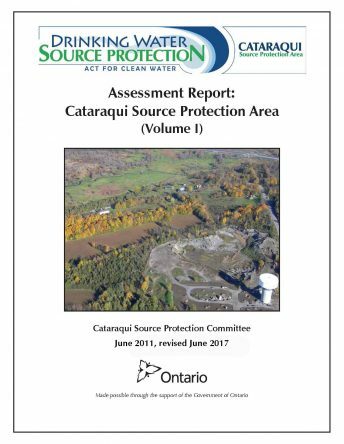 The Cataraqui Source Protection Authority revised portions of the Assessment Report to address updated resource materials made available by the Ontario Ministry of the Environment and Climate Change to comply with the Accessibility for Ontarian with Disabilities Act as well as some minor spacing errors. A more detailed description of the revisions are described in the Notice: Notice of Section 51(1) Amendments.